Hello all! We’ve been busy lately exploring available options on our selection of chairs. On top of our wide selection of chair models and colors/prints, we also offer the option to personalize over 25 chairs with a message, logo, or name, starting at just $7.50 per line. Currently, the two options are imprinting and embroidery. The heat imprint process is just like sign making – letters are cad cut from vinyl and then applied to the canvas under high heat and pressure, fusing the vinyl into the fabric. Many different stock vinyl film colors are available for the letter color as well as many different fonts. The result looks almost identical to silk screening and is just as durable and professional looking. Embroidery is a traditional form of personalizing items by sewing with thread the inscription that you would like. Of course, it is the preferred choice of personalizing on clothing and sports apparel. On our chairs, we offer many different fonts and thread colors to create the unique chair that you desire. Embroidery produces a raised, elegant and durable result. With summer almost upon us, I’d like to take a moment to talk about some of our featured chairs for the beach goers, outdoorsmen and women, and all lovers of chairs. The Original Canopy Backpack Chair by Kelsyus One of the best-selling summer chairs, The Original Canopy Backpack Chair by Kelsyus, is perfect for multiple occasions. Ultra fold-up portability, a folding canopy top, and backpack carrying straps make for a convenient lounger. 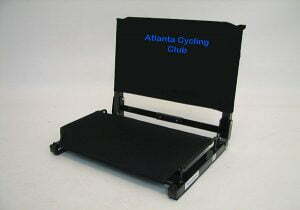 This chair is one of the many available for customization. Have your name imprinted on the inside to tell others to “keep out”. Get yours today and be the envy of your friends! Comments Off on Add Flare to Your Chair! A New Twist on an Old DesignWelcome to our blog!